With global warming, the high altitude resorts of the Alps are in search of attractions to capture new customers (especially foreigners) to compensate for the erosion of their traditional customers base: skiers. As a consequence mountains are being put on stage in many countries such as Switzerland and Austria where suspension bridges, luxury shops and sensational amenities have been built to attract tourists from all over the world, especially Asia. The merchandising of the mountain is under way. The “product” is often a short stop in the mountains as part of a packaged European express tour, often squeezed in between, let’s say, a stay in Rome and another in London, Tourists want to experience as many thrills as possible during a short time, comfortably and by taking no risks. China is no exception with a vertiginuous 200 ft long skywalk , situated 4,700ft above sea level on the side of the Tianmen Mountain in Zhangjiajie, China. In France there is nothing similar, except in Chamonix at the Aiguille du Midi coupled with the current development at the Pointe Helbronner. The void has become a star of these Disneylands, but it has always been used as an attraction and has been showcased innovatively in various part of the world. Then the big question for Alpine regions is how can we reconcile Nature conservation and the demands of the tourist industry? Should the mountain stay a preserved space for nature and lovers of clean air or should it harbor amusement parks for tourists in search of sensations? It is becoming a delicate balancing act between local economic pressures and idealistic aspirations of remote townsfolk, between local politician who want to protect local business developments and centrally defined policies. 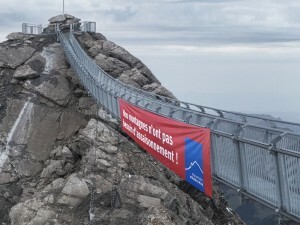 Each new construction in the Alps raises the ire of environmental associations including Mountain Wilderness which sees in those developments a continuous nibbling at the natural space and denounces a constant escalation. In the Alpine Massifs, MW fears a proliferation of all sort of mass tourism equipment, while some, like the megalomaniac project to raise the height of the Klein Matterhorn with a hotel pyramid to reach the 4000 mark, border on fantasy. For most developers these new activities are focused and limited around the cable car sites, most of the remaining areas are devoted to skiing and other Mountain practices while the rest are protected spaces. They also provide quick safe access to the high summits for mountaineers wishing to exploit unstable weather conditions. Alpine tourism is vital for the economy of mountain regions. As the volume of skiers drops, the authorities face the challenge of delivering a balanced response to new development needs while preserving the landscape. It is a complex equation which must take into account many factors, often unique to each region. In the midst of all this, Mountain Wilderness, climbers and other mountain users call for the best possible middle ground.